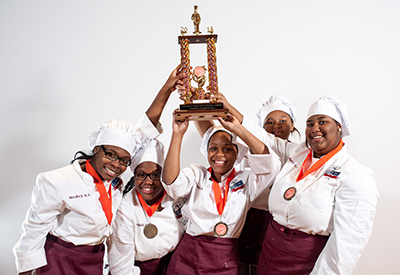 Cooking up Change is a dynamic competition that challenges Chicago high school culinary students to create healthy school meals that taste great and appeal to their fellow students. 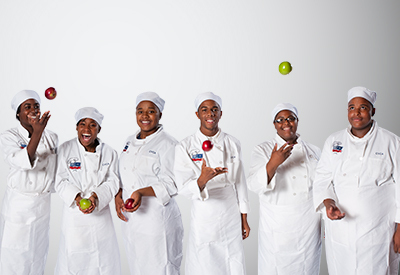 Cooking up Change is about the electricity of competition and tasting the next generation of school meals. 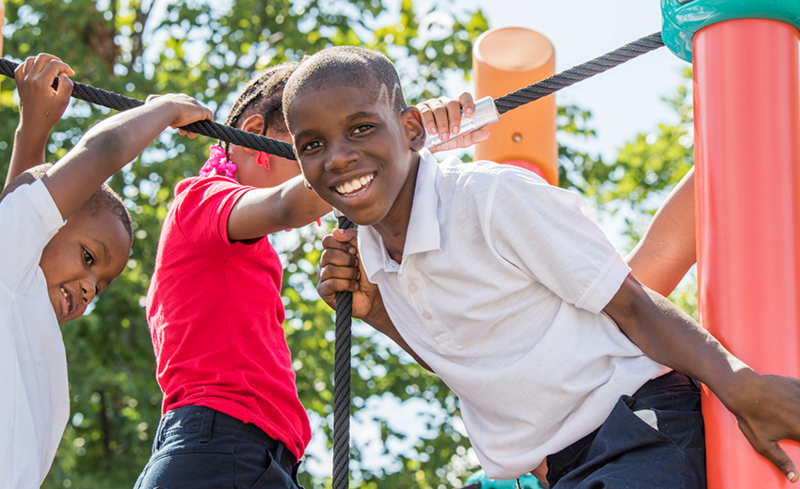 It’s about celebrating the promise of healthy schools. It’s also about launching a conversation. 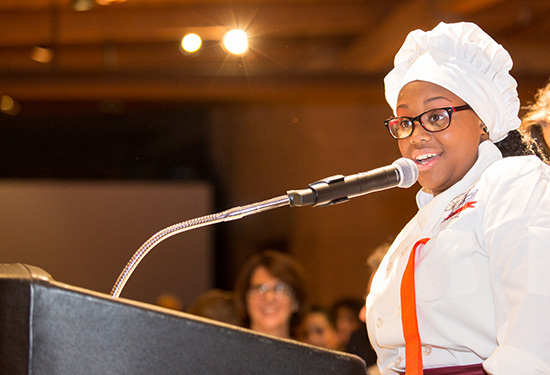 Cooking up Change puts student voices front and center in our city’s conversation about school food, challenging them to create healthy school lunches that their peers will enjoy. 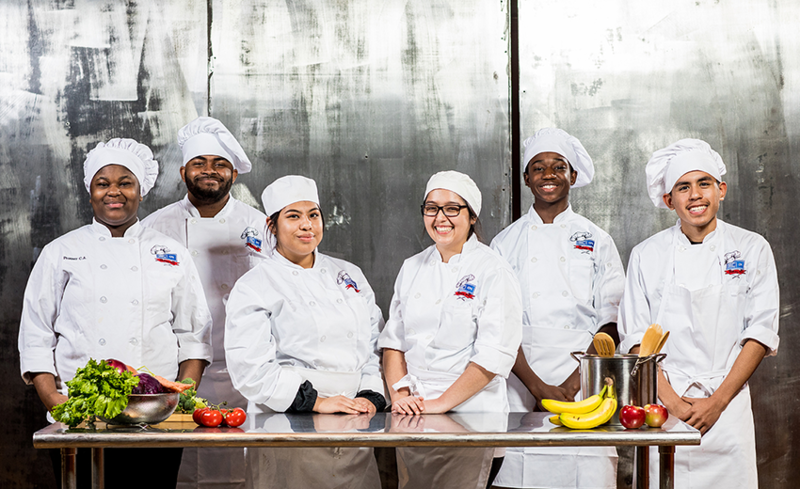 These student chefs show us that it is possible to create meals with plentiful fruits, vegetables and whole grains that can be served as part of school meal programs across the country—and that students will want to eat. 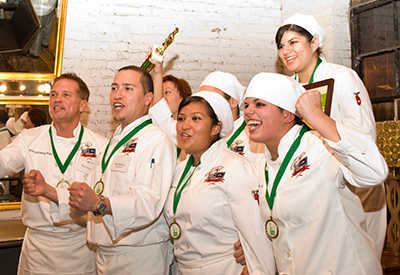 The impact of Cooking up Change extends far beyond the contest and one exciting evening. 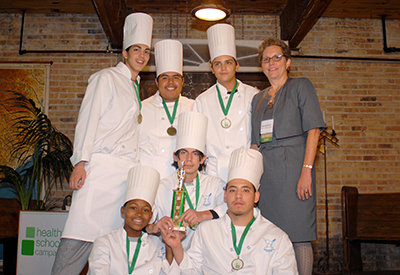 Students develop skills that last a lifetime while making a real impact on school food in Chicago and across the nation. 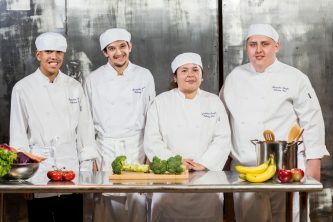 Read more about the impact of Cooking up Change and about one student chef who returned as a judge. Learn more about the opportunities Cooking up Change creates for student leaders, its national reach and highlights from the past 11 seasons! Find out more about how you can get involved in Cooking up Change as a sponsor. 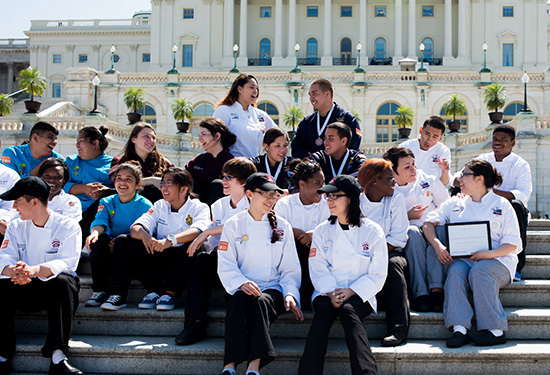 Learn more about our Cooking up Change National program. 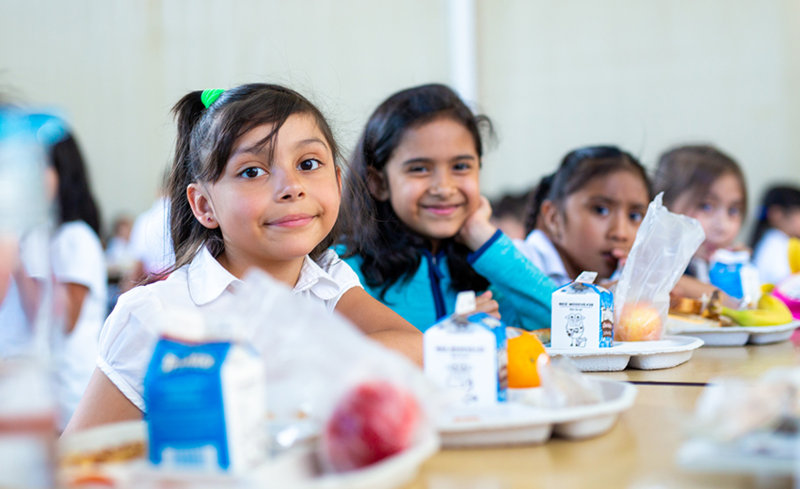 Cooking up Change challenges students to create healthy, great-tasting meals that could be served as part of the district’s school meal program. This means using ingredients and equipment commonly available for school food service. 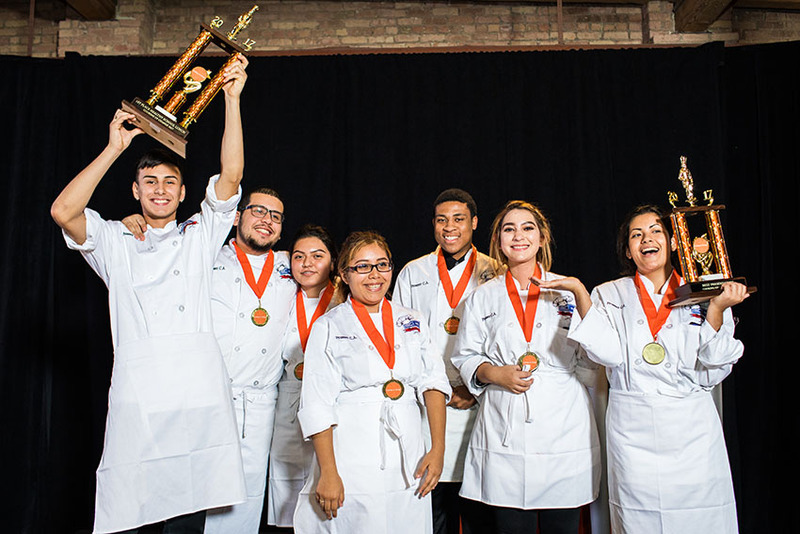 The student chefs who take part in Cooking up Change are enrolled in the Chicago Public Schools Career and Technical Education Culinary program. 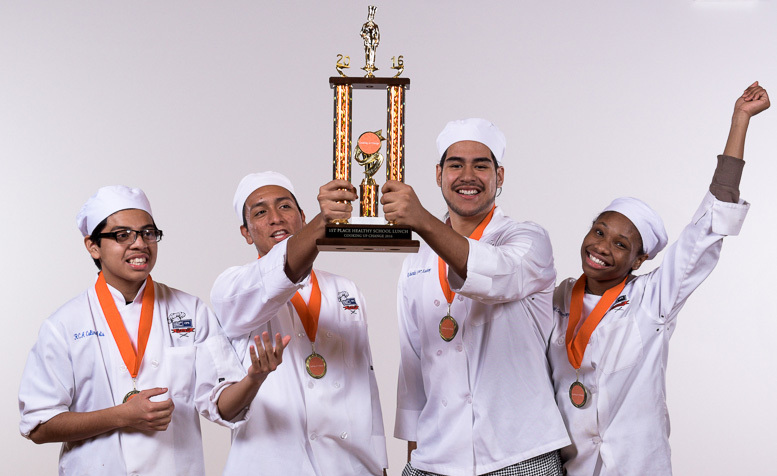 Student teams use the knowledge they’ve gained through their culinary arts studies and guidance from mentors to develop menus and recipes and refine them based on peer taste tests and professional nutrition analysis. 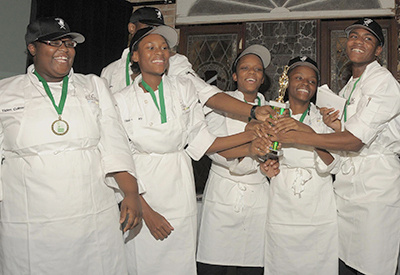 On the day of the competition, students present their meals to a panel of judges—professional chefs, food service professionals, education leaders and public officials, among others—who rate each meal according to its originality, taste, appearance and the quality of the team’s presentation. Read the spotlight on Prosser! Read the spotlight on Richards! Read the spotlight on Washington! Read the spotlight on Marshall! Read the spotlight on CVCA! 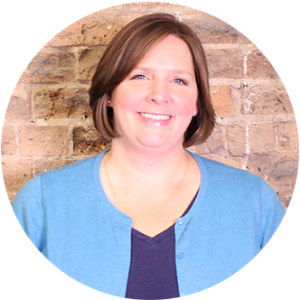 Read the spotlight on Tilden! 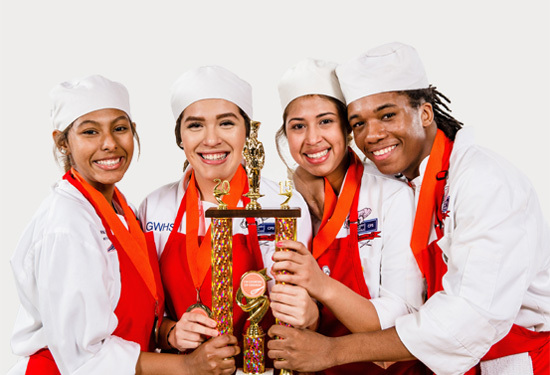 Members of the Cooking up Change judging panel–including food service professionals, professional chefs, education leaders and local officials, among others–take on the challenge of selecting winners among the many excellent student creations. Judges taste and evaluate meals based on a set of criteria that is shared with the student teams at the beginning of the contest. Cooking up Change began as a small program in a few schools. Today, its impact reaches across our city and beyond. On the day their meal is first served in schools city-wide, students celebrate at a special Cooking up Change event at their school. Winning meals have proven hugely popular among students and are now regularly featured on the CPS lunch menu. This is a testament to the students’ skill in creating recipes under real-life constraints, and their ability to design healthy lunches that are popular with their peers. CPS serves a Cooking up Change meal once a month to students across the district. These meals have proved popular with students. 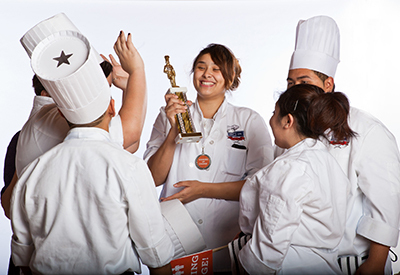 Cooking up Change helps students build their professional skills and networks, challenges them to think creatively and to work together under pressure, and helps them develop leadership skills and experience that translates to success beyond the classroom and outside the kitchen. 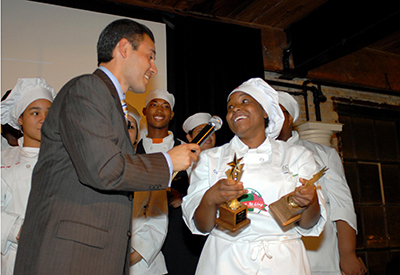 The excitement of the Cooking up Change contest has attracted media attention that shares students’ voices and perspectives with a wide audience. Find out more about sponsoring Cooking up Change. 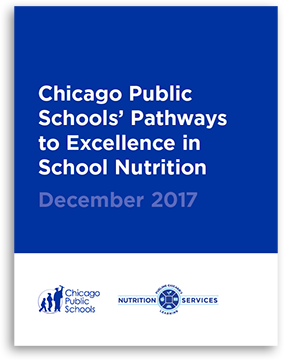 Access related recipes below, or go to our main Resource Center to access recipes across all of our program and policy areas. 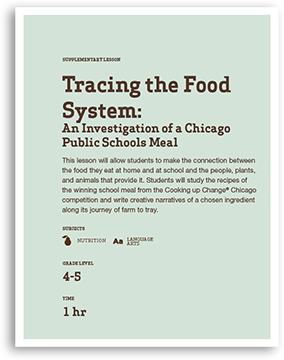 This lesson will allow students to make the connection between the food they eat at home and at school and the people, plants, and animals that provide it. 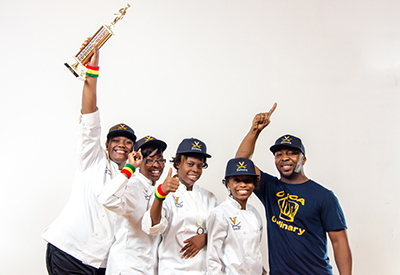 Students will study the recipes of the winning school meal from the Cooking up Change competition and write creative narratives of a chosen ingredient along its journey of farm to tray.